An unexpected truth from a celebrated travel writer: Stillness just might be the ultimate adventure. 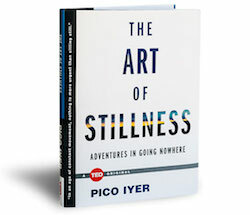 Pico Iyer reveals how stillness can act as a creative catalyst, and advocates for a way of living that counters the frenetic design of our modern lives. Why might a lifelong traveler like Pico Iyer, who has journeyed from Easter Island to Ethiopia, Cuba to Kathmandu, think that sitting quietly in a room might be the ultimate adventure? In The Art of Stillness, Iyer investigate the lives of people who have made a life seeking stillness: from Matthieu Ricard, a Frenchman with a Ph.D. in molecular biology who left a promising scientific career to become a Tibetan monk, to revered singer-songwriter Leonard Cohen, who traded the pleasures of the senses for several years of living the near-silent life of meditation as a Zen monk. Iyer also draws on his own experiences as a travel writer who chooses to spend most of his time in rural Japan — to explore why advances in technology are making us more likely to retreat. He reflects that this is perhaps the reason why many people — even those with no religious commitment — seem to be turning to yoga, or meditation, or seeking silent retreats. These aren't New Age fads so much as ways to rediscover the wisdom of an earlier age. Growing trends like observing an "Internet sabbath" every week — turning off online connections from Friday night to Monday morning — highlight how increasingly desperate many of us are to unplug and bring stillness into our lives. 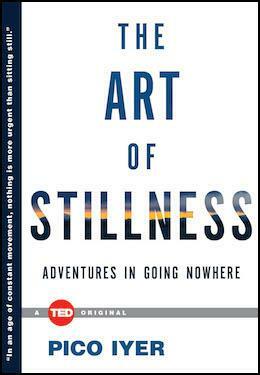 The Art of Stillness paints a picture of why so many — from Marcel Proust to Mahatma Ghandi to Emily Dickinson — have found richness in stillness. Ultimately, Iyer shows that, in this age of constant movement and connectedness, perhaps staying in one place is a more exciting prospect, and a greater necessity than ever before. At some point, all the horizontal trips in the world stop compensating for the need to go deep, into somewhere challenging and unexpected; movement makes most sense when grounded in stillness. In an age of speed, I began to think, nothing could be more invigorating than going slow. In an age of distraction, nothing could feel more luxurious than paying attention. And in an age of constant movement, nothing is more urgent than sitting still. Pico Iyer, a British born essayist and novelist, has an entirely singular sensibility. His various books are linked by his interest in cultural crossroads and the values that transcend boundaries. He has established himself as major presence in culture life of Japan, where he is based, and in the United States, (where he lives during part of the year) Britain (where he was educated), and India where his family traces its roots. An Oxford graduate, he taught at Harvard and is one of few writers whose work, like his interests, transcend cultures.